Filta Group is pleased to announce that it will be providing its environmental impact reduction service known as FiltaFry to two of the main venues of the 2010 Winter Olympics in the Vancouver area. 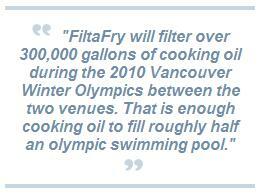 BC Place, the location of the Opening ceremonies, as well as GM Place will both be employing Filta’s micro-cooking oil filtration service known as FiltaFry. 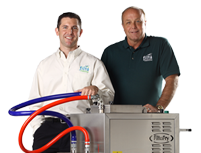 FiltaFry’s service focuses on purification and reduction of wasted cooking oil in commercial fryers. It allows venues such as BC Place and GM Place to drastically reduce their environmental impact due to disposal of used fryer oil while simultaneously improving the food quality in the venues. 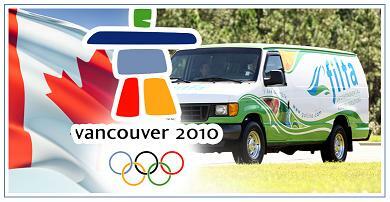 Mr. Hughes also provides the green service for GM Place and the Vancouver Canucks during the NHL season. When interviewed, Mr. Hughes was honored that he was able to do his part in making the 2010 Winter Olympics as environmentally responsible as possible. Mr. Hughes is not the only FiltaFry franchisee to reside on non-American soil. Come February 12th, Filta Group will have franchisee representatives in 27 countries rooting for their prospective national hero’s in their race for the Gold. Filta’s success in 2009 leading up the Vancouver games has caused the unique company attract an ever increasing client roster of high profile venues like those of the Olympic Games, Mile High Stadium, and a list of other professional sports venues. Filta Group is poised to expand on its success in 2009 By offering even more eco-friendly services in 2010. With its soft launch of FiltaCool already a success, it aims on expanding its offerings to include FiltaBIO, and FiltaTAB. Similar to how the Olympics include a variety of sports with an overlying theme of competition and sportsmanship, Filta’s entire line of services all aim to achieve the same core accomplishments. Filta aims to help companies reduce their environmental impact while helping them become more efficient and profitable.